While browsing the Library of Congress Historical American Engineering Record, I came across some photographs of something I had actually seen. A few years ago, I visited the Wyman Gordon Forge in Worcester, Massachusetts in an official capacity to see their (almost) unique 50000 ton press in action. The post war arms race saw a rise in demand from the aerospace and space industry for large closed die aluminium and titanium forgings. Larger forgings of simple shaped parts had been made in the past on open die forging presses, where hot metal is squeezed repeatedly into shape (think of a blacksmith hammering hot metal on an anvil), but closed die is different as the hot metal is squeezed between the two parts of a ‘mould’ to create a part that is near net shape and just requires finished machining. But to do this form of forgoing requires a huge amount of power, far more than open die. They were deemed so strategically important, that two identical presses were built, one for Wyman Gordon on the east coast, near Boston, and one for Alcoa, that was positioned on the west coast. For many years, the different parts of the factory were completely segregated from one another and you could not go into a different department without appropriate permission. The different parts of the factory were reached by an enormous tunnel that stretched from the admin block all the way to the far side of the million square foot plant, with stairways up to the different departments. 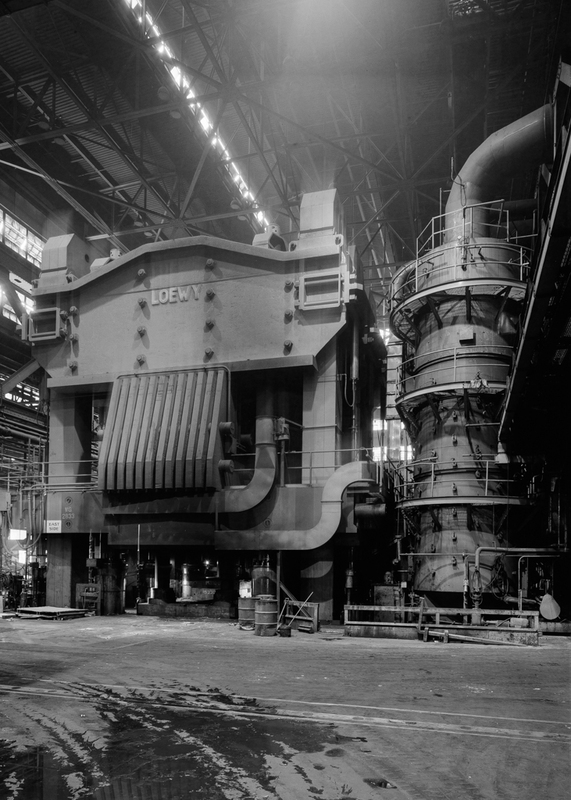 Since it was built, it has been surpassed in size by the monumental 65000 ton press at Interforge in Issoire in France, which I have also witnessed in operation. This really is an enormous piece of machinery, to the point where the building was built around it and rumour has it has been operated at greater pressures than 65000 tons. Mind you it was designed and built in Russia so given their reputation for over engineering things, it is no doubt well capable. Bear in mind also that forging presses are similar to icebergs, there’s just as much below the surface, if not substantially more, than above the surface. Unfortunately I was not allowed to take pictures of it and the only pictures on the web are somewhat small.